Then my daughter went through a phase where the only vegetable she would eat for a month was salsa. Yup, I became that mom. 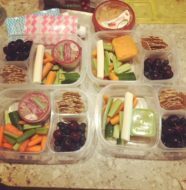 The mom I never thought I would be, lamenting how my daughter’s picky eating. Granted, she ate at least a half cup of salsa a day, but I did have some major mama guilt. Add on to that my pregnancy and aversion to cooked vegetables, and I realized that I need to create a green smoothie that would appeal to us both. 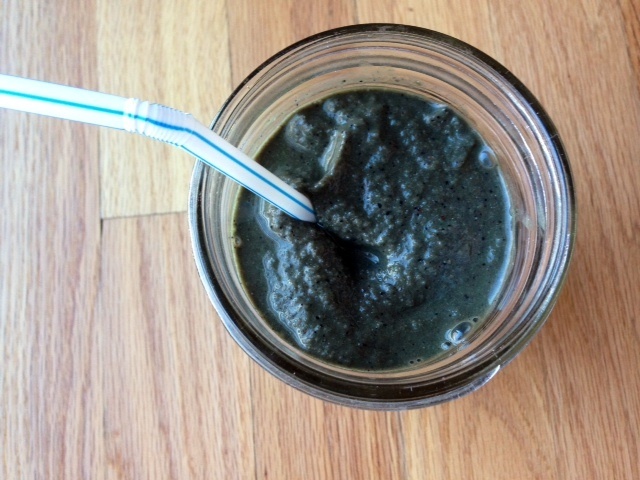 This smoothie tastes like a chocolate shake but is packed with superfoods: dates, chia seeds, ground flax, blueberries, bananas, and a generous handful of spinach. Dates: Dates are a natural sweetener and great for the digestion system. They also contain Vitamin A and K, and are a good source for potassium. 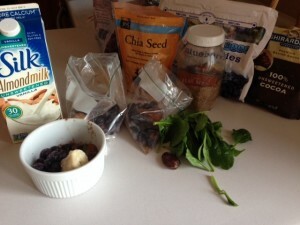 Chia Seeds: Chia seeds help you stay full longer which is the main reason I included them in the shake. 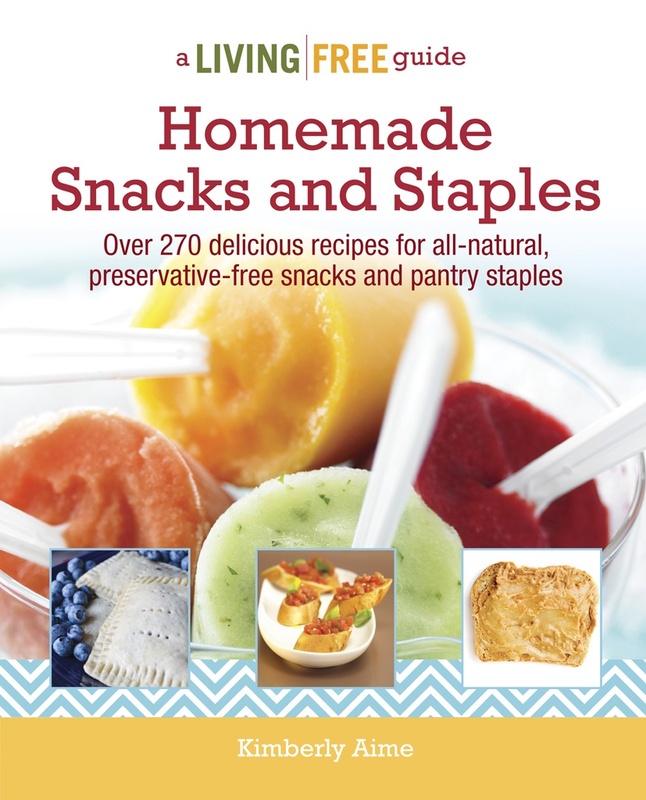 They are also packed with antioxidants and omega-3 fatty acids. Unlike flax seeds, they can be digested whole. Ground Flax: This is another great source for omega-3 fatty acids. They are also a good source of manganese and Vitamain B1. Like dates, they aid in digestion. Blueberries– The real reason I added (frozen) blueberries is that it makes the chocolate taste chocolatey-er. They are also a great source of Vitamin C.
Bananas– Like the blueberries, I added bananas for taste: frozen bananas give the shake an ice cream like quality that can’t be beat. They are also a good source of potassium and for Baby G, they can counteract all these “aid in digestion” ingredients. Let’s just say she has never had that problem. Spinach: Spinach is packed with Vitamin A and K. It also contains some folate, iron, and calcium. And let’s be honest, I feel a little better as a mom (and a pregnant woman) knowing that all of my babies are getting some spinach each day in addition to the copious amounts of salsa. To make mornings run smoother, I have started creating shake packs that I keep in the freezer. 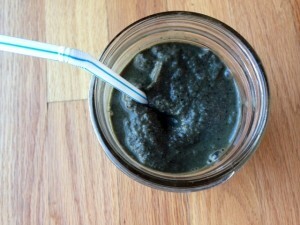 After my morning run, my daughter and I dump our pack in the blender, add spinach and almond milk, and voila! Breakfast of champions. I am going to give you the recipe below per pack. In a perfect world, I would make up to 2 weeks worth at time, but in reality, I am usually short on at least one ingredient, so I just make as many as I can. A nutrition powerhouse disguised as a chocolate shake. Combine cocoa, chia seeds, ground flaxseeds, date, frozen blueberries, frozen banana, and ice to a freezer zipper lock bag. When ready to make the shake, dump contents of bag into blender. 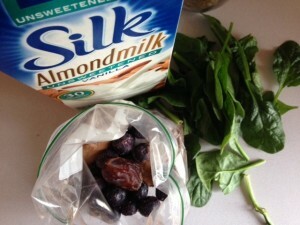 Add handful of spinach and cover with almond milk (or milk of your choice). Blend and enjoy! I recommend spinach for the shake. I tried kale, but for me, it tasted too green. These shakes are a great way to start your day. I mean, how many people can say they had spinach for breakfast? Add on to that, how many toddlers can say they had spinach for breakfast? Okay, even G can’t say that. 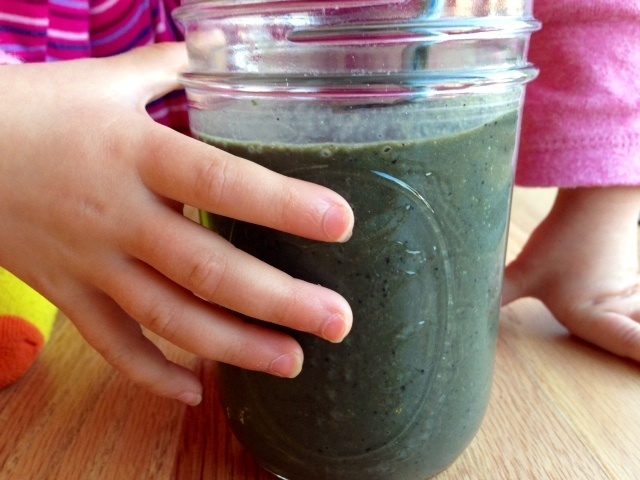 How many moms can say their toddler had spinach for breakfast? 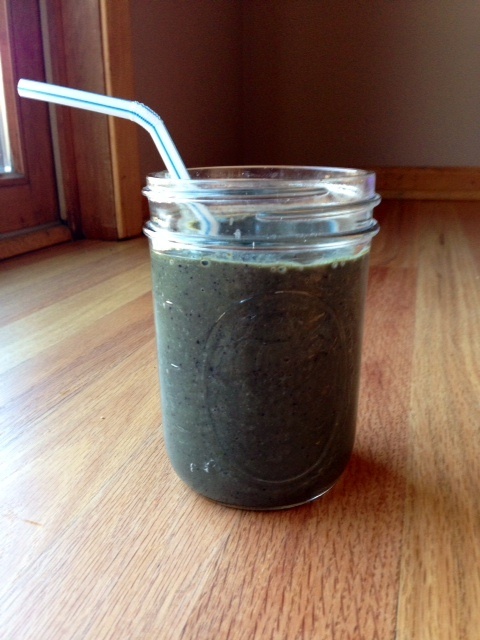 Green Smoothies: Yay or Nay? Do you have any favorite sneaky veggie smoothies? Disclaimer: Thought I talk about ‘hiding’ and ‘sneaking’ veggies in this smoothie, I am very open with G about the ingredients and repeatedly tell her how it’s the spinach (not the chocolate) that makes the smoothie taste good. I even have her help me put the spinach in the blender. I would never condone being sneaky about putting vegetables in any dish. 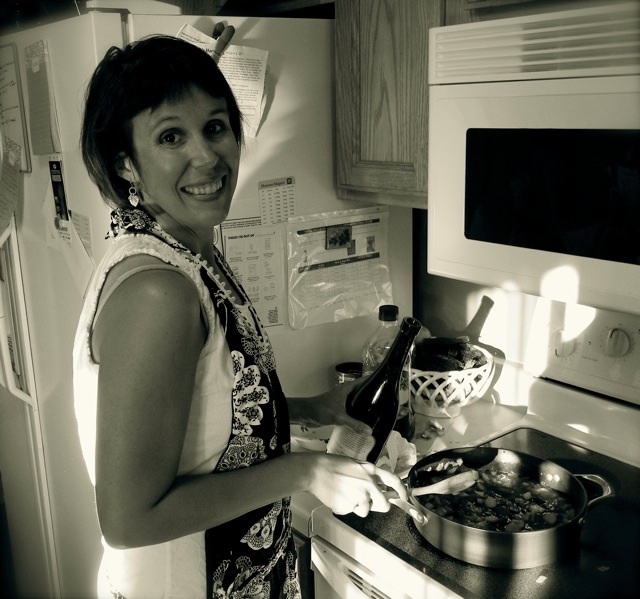 I do condone getting veggies into any and all dishes that we can as moms, and as people who want to lead healthy lives. 298 Comments on "Chocolate and Greens Smoothie Packs"
this website consists of awesome and actually fine stuff in support of visitors. I simply want to mention I’m very new to blogging and site-building and truly enjoyed this blog. Likely I’m likely to bookmark your website . You absolutely have fabulous stories. Kudos for sharing with us your web site. subsequent articles relating to this article. I want to read more issues about it! yours is the greatest I’ve discovered so far. But, what concerning the bottom line? thus I simply use world wide web for that reason, and take the newest news. means understand. It kind of feels too complex and extremely vast for me. Great remarkable things here. I¡¦m very happy to see your article. Thanks so much and i’m looking forward to touch you. Will you please drop me a mail? certainly like your web-site however you have to check the spelling on quite a few of your posts. Several of them are rife with spelling issues and I find it very bothersome to tell the reality however I will definitely come again again. Wow, wonderful blog format! How lengthy have you been blogging for? you make running a blog glance easy. The entire glance of your website is excellent, as smartly as the content material! suit your needs? I wouldn’t mind producing a post or elaborating on many of the subjects you write related to here. Whats Going down i am new to this, I stumbled upon this I’ve discovered It absolutely helpful and it has helped me out loads. I am hoping to give a contribution & assist other customers like its helped me. Good job. great put up, very informative. I’m wondering why the other experts of this sector don’t realize this. You must continue your writing. I’m confident, you have a great readers’ base already! I wanted to draft you one bit of remark just to say thanks a lot once again relating to the beautiful opinions you have shown above. It has been quite strangely generous of people like you to grant unreservedly precisely what most people could possibly have made available as an e-book to get some cash for themselves, specifically considering that you could possibly have done it in case you considered necessary. Those smart ideas additionally worked as the good way to know that some people have the same passion similar to mine to see way more on the topic of this issue. I believe there are numerous more pleasurable situations in the future for individuals who looked over your blog post. Thank you, I’ve recently been searching for information approximately this topic for ages and yours is the best I’ve discovered till now. However, what concerning the bottom line? Are you sure about the source? site-building after that i suggest him/her to pay a visit this website, Keep up the nice work. Good ¡V I should certainly pronounce, impressed with your web site. I had no trouble navigating through all the tabs and related information ended up being truly simple to do to access. I recently found what I hoped for before you know it in the least. Quite unusual. Is likely to appreciate it for those who add forums or anything, site theme . a tones way for your customer to communicate. Nice task..
will be checking back soon. Please visit my web site too and tell me what you think. Thanks for every other informative web site. The place else could I am getting that type of info written in such an ideal way? I’ve a challenge that I am just now operating on, and I’ve been on the glance out for such information. Hi there! I could have sworn I’ve been to this web site before but after going through a few of the posts I realized it’s new to me. Hello.This article was extremely fascinating, especially since I was investigating for thoughts on this topic last Friday. I must express some appreciation to this writer just for bailing me out of this trouble. Because of scouting through the internet and obtaining ways which were not helpful, I assumed my entire life was done. Living without the strategies to the issues you’ve fixed through your review is a serious case, and the ones which might have adversely affected my entire career if I had not come across your web blog. The understanding and kindness in maneuvering almost everything was tremendous. I don’t know what I would’ve done if I had not come upon such a thing like this. I’m able to at this time look ahead to my future. Thanks very much for this high quality and results-oriented help. I won’t be reluctant to endorse your blog post to anyone who needs counselling about this issue. You’re so awesome! I don’t think I’ve truly read a single thing like this before. So good to discover another person with a few original thoughts on this topic. Seriously.. many thanks for starting this up. This website is one thing that is required on the web, someone with some originality! Quality content is the key to attract the visitors to visit the website, that’s what this website is providing. lot more neatly-appreciated than you may be right now. You’re very intelligent. DU2izW Im obliged for the blog article.Really looking forward to read more. Great. run and it is time to be happy. I’ve read this post and if I may just I wish to suggest you some attention-grabbing issues or advice. Hi, Neat post. There is a problem along with your web site in web explorer, might test this¡K IE still is the marketplace leader and a good section of folks will leave out your fantastic writing due to this problem. internet without my permission. Do you know any techniques to help protect against content from being ripped off? Valuable information. Fortunate me I found your web site by chance, and I’m shocked why this twist of fate didn’t took place in advance! Pretty element of content. I just stumbled upon your web site and in accession capital to claim that I acquire in fact loved account your blog posts. Anyway I will be subscribing in your feeds or even I achievement you get admission to constantly rapidly. YRh8Dy Say, you got a nice blog article.Much thanks again. Cool. blog on regular basis to get updated from most up-to-date reports. Hi there, of course this paragraph is genuinely nice and I have learned lot of things from it on the topic of blogging. enjoyment, since this this web page conations really fastidious funny material too. Hello to every , because I am really keen of reading this webpage’s post to be updated regularly. I think the admin of this site is actually working hard in favor of his site, since here every data is quality based stuff. I am truly grateful to the holder of this site who has shared this wonderful piece of writing at at this place.